Those portable coffee makers are all the rage nowadays but I still love brewing my own fresh coffee in the morning while camping. It’s very simple once you have the method down and nothing tastes quite like fresh coffee brewed over a campfire that you built. Below is a very easy to follow guide showing you the best way to make coffee while camping. Getting my ‘cup of Joe’ first thing in the morning is my first and primary task of the day, I’m just too damn grouchy without it.. ask my wife, I’m positive she will agree, ha. Making campfire coffee this way, costs almost nothing, no fancy gadgets to take up unnecessary room or to carry around with you. Before you head off camping you will need to prepare the following! 1: Take a normal sized coffee filter and press it into a small cup or small jar. 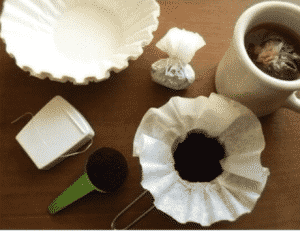 You should now have a little coffee filter pouch of ground coffee, like in the image. 4: Repeat these steps to make your desired amount of coffee portions. Tip** Put your little bags in a sealed Tupperware box or a sealed bag, keep them dry and as fresh as possible. 3: Once water is boiling drop in one of your pre made coffee filter bags, leaving the excess string hanging outside the pot. Brew and steep for two to three minutes. 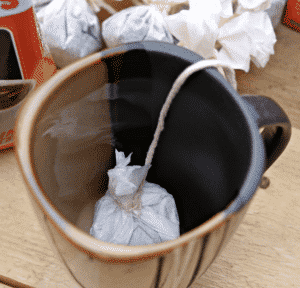 4: Take out the coffee bag and put it in trash or even throw it in the fire. 5: Using your heat resistant gloves or using a towel or thick piece of cloth grab the handle on your pot or kettle and pour into your cup. 6: Grab a spare chair, put your feet up and enjoy! Bliss! Got a different spin on how to make coffee while camping? We would LOVE to hear how you go about it. Leave your tips and comments in the comments section below.